Living just to the south of Nottingham I am only a stones through away from Loughborough. I am often lucky enough to be hired for private parties, corporate events and weddings in the Loughborough area and keep getting invited back by the same clients who enjoy my magic. I now regularly get booked as a Loughborough wedding magician. This usually entails performing for your guests during the reception of during the evening function. You can view a demo of me performing my eye catching magic on a video on my home page of http://www.alexmagic.co.uk A wedding should be the happiest day of your life and what I offer should make sure your guests have an unforgettable day and are thoroughly entertained. I am fortunate to be invited to perform at so many birthday parties in the Loughborough area over the years and make the children so happy. My magic show is aimed at 3-12 year olds and has lots of fun interaction and I event teach the children a trick or two. Childrens Entertainer Loughborough – As part of the party package I also run a mini disco and games for the children’s as well as face painting. 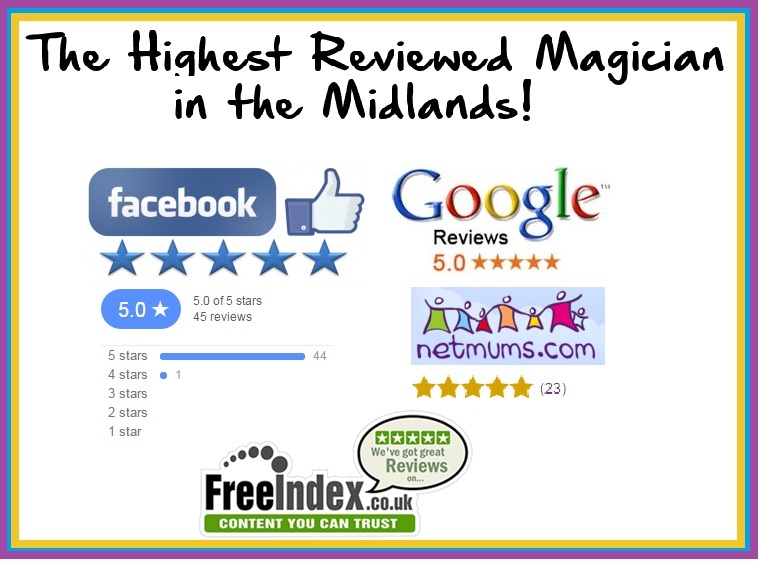 Please have a look at my website to see my specific packages I offer as well as live clips of me performing at childrens birthday parties http://www.alexmagic.co.uk If you need advice finding a suitable hall or community centre in the Loughborough area please let me know and I will do my best to help as I have performed at many over the years! Magician Loughborough for all occasions – Please get in touch should you wish to hire me or if you have any other questions. Magician Loughborough for hire! My facebook page is here also.